I’ve been publishing images of various fashion phenomena on my Facebook for a while now. However THIS created such a great disturbance in The Force that I thought it worth of sharing on blog too. Behold, Star Wars fans! I understand the fashion world is obsessed over hats. I also understand it is difficult to come up with something new every season. We have already witnessed Anna Sui cat hats, Thakoon’s bi-colored hats, Miu Miu’s turbans… but Balenciaga?! “Nicolas! Nicolas, don’t — it’s a trap! It’s a trap!” Too late… he is on the dark side now. You can’t trick us by wearing clashing prints instead of traditional black cape either. We know WHO you are – Darth Vader! In fact, I think Star Wars would benefit from re-making the scene where the Dark Lord revealed his face. Seriously, who cares about some wrinkled white-faced guy with exaggerated under eye dark circles? Show us his legs! That would be a real controversy. Images used to prove the case (i.e. to make these collages): style.com and google. Collages are property of crashingred.com, make sure to ask before using them. I’ve never liked Star Wars but your post was so interesting to read! and those shoes in the second photo are the fiercest! I love Star Wars, brilliant post! Those hats are really interesting. reminds me so much of my hair now. haha! Ha! Yes, I think I’ll be giving this one a miss too… although I used to have the most sublime cashmere double breasted full length coat with a whopping great hood that did look a little Obi Wan Kenobi in the right light… So maybe what I’m saying is that Starwars can sometimes work? Great post, definitely something different to wear, that is for sure. hahahah well, you have to give him cred for trying to make Darth Vader a trend! I’ve personally always thought Darth Vader is the best-dressed of all the characters. I mean, black is such a classic! Hilarious! I’m a Star Wars fan (the original trilogy, not the more recent ones). Darth would have completely destroyed the runways, seeing his helmet likenesses on it! Hahaha this made me laugh out loud! – WSM. Haha so funny…thanks for sharing! This is hilarious! Wonderful read and I actually love the hat and shoes! 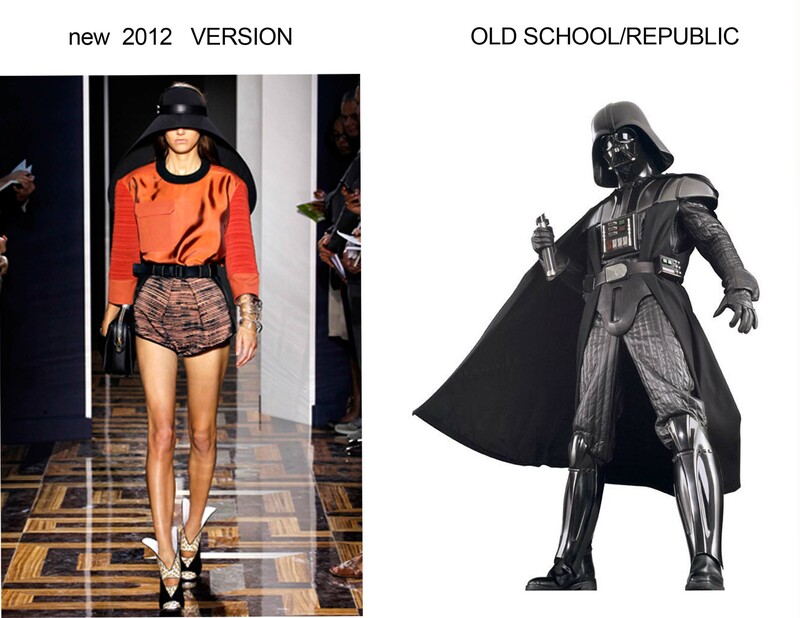 As a fan of both Balenciaga and Star Wars, I loved this post. Great comparison. 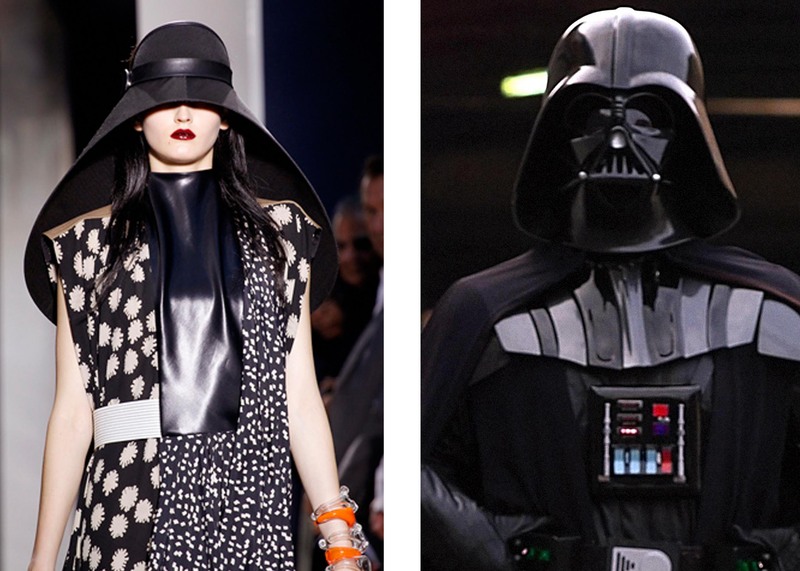 Since Balenciaga had all his inspiration from the outfits of the fisherman in the village in Spain, where he came from, the question is: did Darth Vader like fishing?